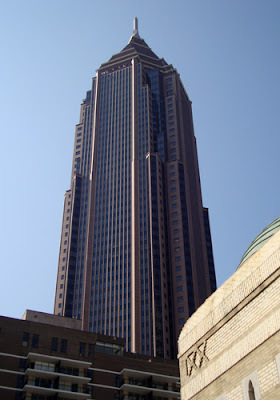 The Bank of America Plaza is the tallest building in Atlanta at 1,023 feet, but has only 55 stories of office space. Its top blazes golden at night, a tell-tale sign of its 23-karat gold-leafed open-air pyramid, topped with an obelisk. For the longest time, following its completion in 1992, I wasn't sure when they were going to finish the top. I had not seen what is now the signature open-air design of the top, which sits on a pillar of dark red granite. The building still today serves as a point of demarcation between Midtown and Downtown Atlanta.